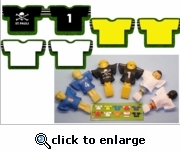 Support your favorite team with these foosball jerseys. Choose white and design your own with sharpies or fabric markers. USA team coming soon! !